It's cold in Siberia. 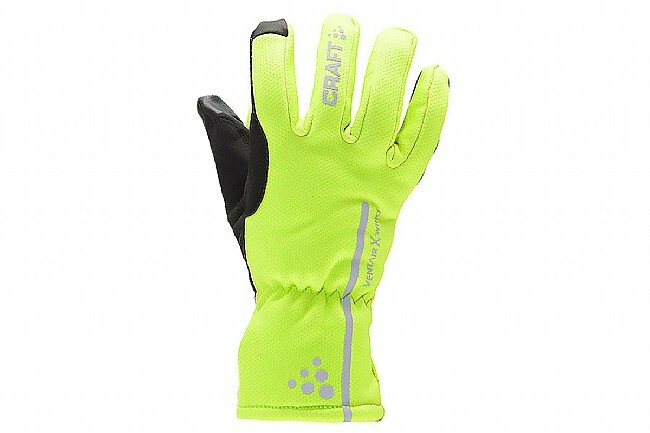 This aptly named glove is ready to stand up to the most challenging weather conditions, there or anywhere. Developed for the extreme, all-seasons cyclist the Siberian combines a fully wind/waterproof outer with warm fleece-like interior. A water repellant softshell fabric encases the palm and silicone grippers have also been added throughout the underside for increased grip. Additional features include a Velcro® closure a d a soft terry thumb wipe. 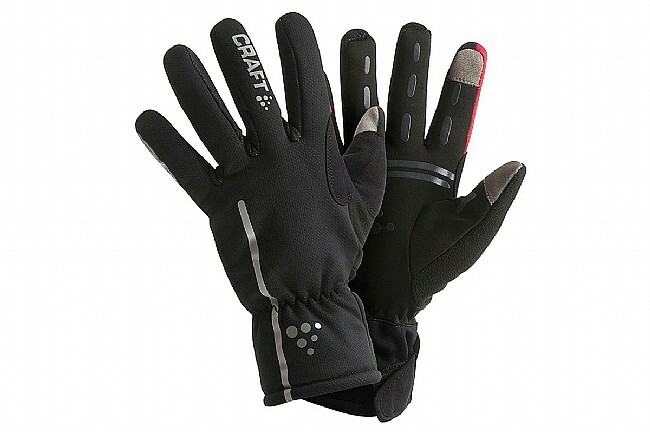 The Craft Siberian Glove is available in Black/Red or Amino and features reflective accents for added visibility. Palm Circumference 8½"-0" 8.67"-0" 9"-0" 9.34"-0" 9¾"-0"
WE ran water over these. OUr hands were definitely damp. We dont consider them waterproof therefore. These gloves motivate me to ride more, in cold weather. These gloves work great, down to about 25 degrees.Any lower and I find my hands get cold, but not freezing. One of the other great feature of these gloves is they breath. My hands don't get sweaty, even when it warms up to fifty.At first they seem a little bulky like a ski glove,but I have no problem working gears or breaks, I can even zip my wind breaker. They also have good grip. First let me say that the name of this glove is very misleading. When you hear the name Siberia, you think of bitterly cold or frozen tundra type conditions, right? Well, the Siberia that Craft were thinking of was certainly in a warmer climate than the name implies. On the surface, the glove has some really great features that have it in the running to be a standout winner. These include grip inspiring gel areas in the palm and finger areas, reinforced material in the index and thumb tips for shifting abuse, a fleece nose wipe, color and reflective accents to help you be seen, and very comfortable fleece lining to form an overall attractive package. Then comes the downside! They have a marketing name scrolled along the side of the glove that reads, Ventair X wind. I am not quite sure what this technology or layer is supposed to do, but it seems that it was either left out, or was not designed properly. This marketing hype is just that and should not be confused with any type of Windstopper or Goretex membrane type materials. I chose to put these gloves to the test on my 2013 New Year's Day ride that saw low wind speeds of 4-5 mph and temperatures steady at 15 degrees F. Within the first 2 miles my fingertips were already starting to tingle and were at a full-on frostbite-style burn at 4 miles. Sadly, my New Year's epic was cut short do to buying into marketing hype. There must be someplace named Siberia along the gulf coast of the southern states. Bottom line if you are riding in temperature ranges from 30-40 degrees, these gloves would be very nice. Anything below this and you should keep shopping for something with a proven membrane material. I live in the desert, so I'm a wuss in cold weather. These work great for 30-40 range. I add a liner below that and have ridden with little trouble down to 20F. I have really small hands and the size small is perfect, so they run a bit small for most people. Only gripe is that they are too snug to slide a large hand warmer in and they soaked through after about 30 minutes of hard rain on the 2 occasions I've tried that in. These do run on the small side especially in the fingers, I ordered XL and could still use more room in the fingers. I recently tested in a 1 hour commute in constant rain and my hands stayed dry! I use these almost every day on my morning commute and they work nice between 27-40 degrees F. It's probably just me but my hands take a while to warm up and rides in the lower 20's are probably pushing it with this glove. I use this glove to commute in cold weather, from 40F to mid 20's. Below the low 20's I use the claw style gloves. The sizes run small. I normally wear a large, but needed an XL in these. I really like the fit of these gloves. Overall great quality and performance. Fit is on the small side - so go up one size for a proper fit. I use them for winter rides in 35 - 15 degrees. I bought these gloves in XL which is my normal glove size and they were too tight & short in the fingers. I did really like the styling and quality so I gave them to my son. Do I order XXL? I've never bought anythin in XXL before. Hmm. Beware. High quality but fit is a little off. Top-notch quality and lots of reflective material. My only complaint is that the fingers are a little short resulting in my fingertips pushing against the end of the glove when I grip the handlebars. I'm a big fan of Craft gear, so I ordered the XL, my usual glove size. These XLs were ridiculously small so I gave them to my wife, whose hands are a W medium glove. Seems like a well-built warm glove, but she doesn't have many miles on them yet. They keep my hands toasty and dry. Great gloves for cold weather. Get them a bit big for best results. Very warm, comfortable glove. Good dexterity. Water resistant. I was hesitant to buy this unfamiliar product, but they are the best cold weather gloves I have ever used. I rode ten hours in windy, 30-40F temps in comfort. Dexterity is not affected for routine cycling needs like brake and shifter operation and retrieving your water bottle. This is the warmest bike glove that I own. Works great down into the teens. Keeps hands warm and dry. These gloves will keep your hands nice and toasty! I have used these gloves in weather ranging from about 32 - mid-40's and they are great. I will admit that when it's gets into the 40's they are almost too warm. In the colder weather 32 I did wear some glove liners with these and they were nice and warm. a great glove gets even better!! This is my second pair of Siberians I simply wore my old ones out! Fit is snug, for good dexterity when shifting or braking. I never feel as if my hands are swimming around in bulky mitts. To boot, this new edition is even warmer than my old ones- on a 2-hr. ride in 45 degree weather they were almost TOO warm! While I'm not enamored with the red forefingers and smart-phone friendly fingertips seem ludicrous to me, if they'll hold up for as many years as my old pair I'll buy 'em again.